This item is qualified for FREE GROUND SHIPPING! Maintaining a healthy body is a life long pursuit for many of us. As we strive towards adoption of consistent healthy lifestyle choices, regular exercise and a balanced diet should be incorporated into daily life. 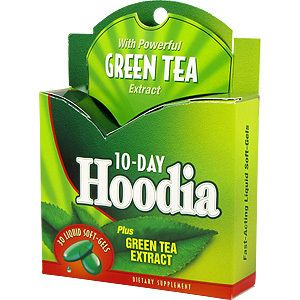 10-Day Hoodia with powerful Green Tea extract helps support your lifestyle goals. Hoodia gordonii - Previously unknown to the Western world, African tribesmen have eaten Hoodia gordonii for hundreds of years. Garcinia cambogia - Contains a compound discovered in the 1960's that has the potential of inhibiting a key step in fat synthesis. 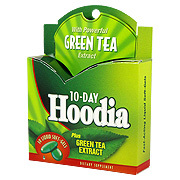 Green Tea Extract - Enhances the immune system with antioxidant support. Choline, Inositol & L-Methionine - These ingredients are necessary co-factors in the metabolism of proteins, fats and carbohydrates. 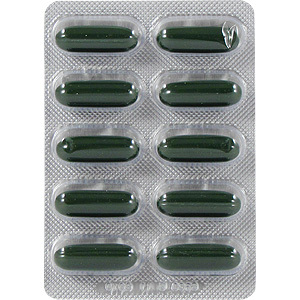 (Adult) Take one (1) Liquid Soft-Gel three times daily with meals and a full glass of water for 10 days. For extra results, take two (2) Liquid Soft-Gels three times daily as directed. If caffeine keeps you up at night, do not take this product in the evening, since it contains natural caffeine. Usage Warning: Do not use if safety seal is broken. This product contains caffeine and may affect blood pressure and/or heart conditions. Check with your doctor before using the product if you are using medication or have any medical conditions. Do not use if you are pregnant or nursing. Do not exceed recommended daily intake. Not intended for use by persons under 18. KEEP OUT OF REACH OF CHILDREN. Store in a cool, dry place. 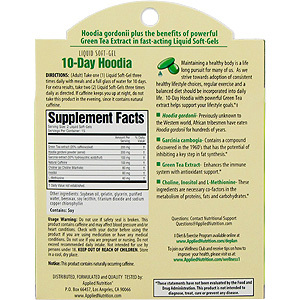 10 Day Hoodia Plus Green Tea Extract is shipped in a discrete, unmarked package. Orders are processed immediately and usually take about 3 to 5 working days to be received. We do ask that you try it for 2 to 3 weeks to feel the full effects. Any information received is used only for order processing and shipping purposes. Your information, such as e-mail address, will never be disclosed to a third party.